Q. How can I read an EBSCO eBook if I am using a Mac? Some Mac OS users have discovered problems viewing EBSCO eBooks. 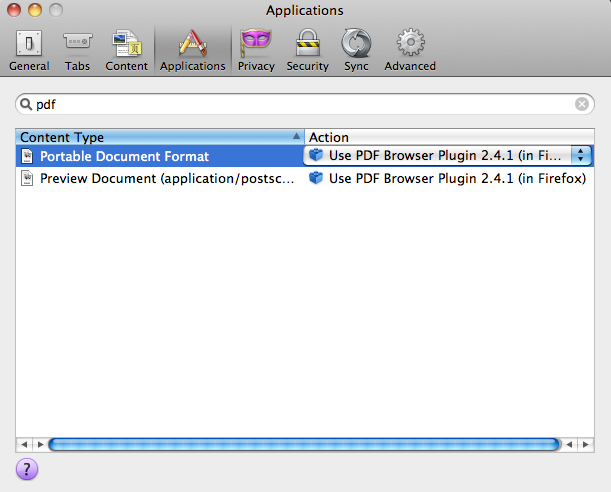 The Schubert|it PDF plugin supports both Safari and Firefox and is simple to install. Open the .dmg file you download and following the steps as prompted. The first time you view a PDF, you will likely be asked for licensing information. As a student, faculty or staff of UNF, you may choose Educational to avoid licensing fees. If you continue to have problems, you may need to check your browser preferences to ensure that it is configured to view ODFs using the "plugin in the browser". See the image below as an example.